On April 25th, FIRE had their Take Back Our Lives event. This included a rally/open-mic, march, and performance. It was a community event to bring together marginalized groups and reclaim space. They had about 100 people attend. Students and community members from all sorts of various sexes, religions, races, ethnicities, ability, gender identity, sexual orientation, document status, and more, gathered to share their stories on campus.This unifying event brought visibility to those who are often silenced, especially in a red state like Kansas. 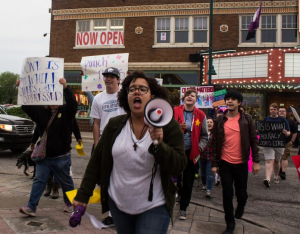 They were met with cheers and honks of support from those throughout Aggieville as they marched through the area and back to campus, where they wrapped the night up with more performances and sharing.